Mr. Lim Kim Seng, Malaria Consortium Pailin Field Office Coordinator received the award from HE. Dr. Te Kuy Seang, the Secretary of State of Cambodia. 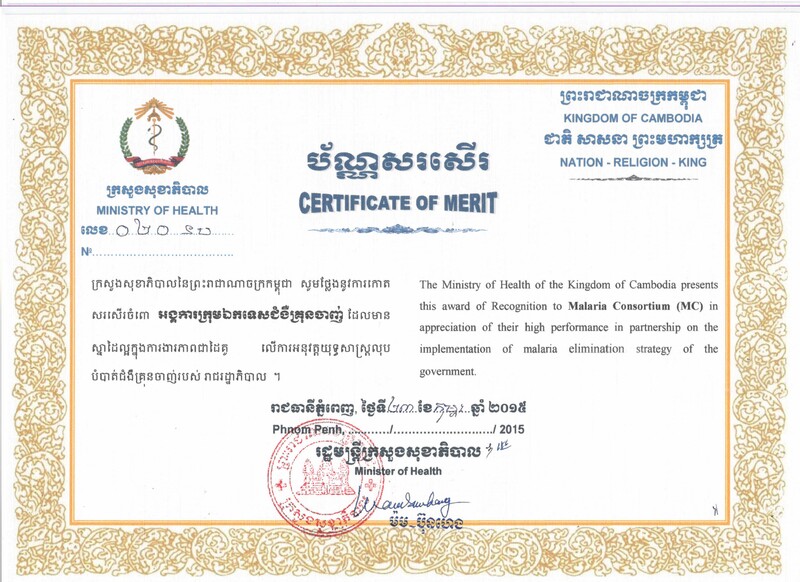 Malaria Consortium was awarded a Certificate of Merit in recognition of its work implementing the Ministry of Health’s malaria elimination strategy in Cambodia. On 26th February 2015, the Provincial Health Department of Pailin (PHD) organised an annual conference to review the achievements of 2014 and look ahead at plans for 2015. Malaria Consortium’s Pailin office, as a working partner of the PHD, contributed by co-organising this event. Over one hundred participants attended, including Village Malaria Workers, staff from government offices and the NGO sector and representatives from the Health Center Member Committee. The ceremony was presided by His Excellency Mr. Ing Vuth, Deputy Provincial Governor of Pailin Province. Malaria Consortium – one of the leading non-profit organisations specialising in the prevention, control and treatment of malaria and neglected tropical diseases – was honoured to receive the Certificate of Merit from HE. Dr. Te Kuy Seang, the Secretary of State of Cambodia. The award was granted in appreciation and recognition of the NGOs and government departments that have contributed to the health sector and Ministry of Health activities in the country. Mr. Lim Kim Seng, Malaria Consortium Pailin Field Office Coordinator was at the event to receive the award on behalf of the organisation. Malaria Consortium established an office in Cambodia in 2009, with field offices located in Pailin (since 2009) and Rattanakiri (since 2014), in addition to supporting activities in multiple other provinces. Since its inception, Malaria Consortium has assisted at both provincial and national level to strengthen the capacity of government officers and provide technical support for malaria control and elimination. In addition, Malaria Consortium has worked to conduct cutting-edge implementation research in close collaboration with the national malaria control programme and provincial health departments in order to assist Cambodia in tackling antimalarial drug resistance. Pailin is one of the early provinces where artemisinin resistance was identified, and continues to be a key location for managing resistant malaria. Malaria Consortium has been implementing projects in Pailin to eliminate artemisinin resistance, including support to the Village Malaria Worker programme, identifying the burden of asymptomatic and resistant malaria in the border-crossing population, research to explore the use of reactive case detection approaches, and piloting of surveillance and mHealth approaches for real-time reporting and response to malaria cases. To learn more about the current projects we are working on in Cambodia and the wider Asia region, please click here. 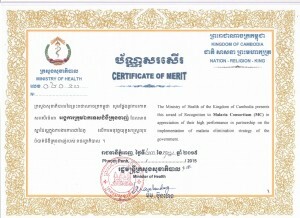 The Certificate of Merit as a recognition of the high performance in partnership on the implementation of malaria elimination strategy from the Ministry of Health of the Kingdom of Cambodia. Wanweena Tangsathianraphap is External Communications Officer in Asia.